It isn't every day that you see a bride and groom performing live on the wedding day at Château Le Parc! Besides, this couple not only danced like professionals but also send and, in this picture, beat of the drums that were literally on fire. During the wedding reception the entertainment team brought a couple of metal barrels. When the light band started singing, the bride and groom approached the barrels and started beating the drums. The temple celebrated and suddenly one of the entertainers poured a liquid on top of the barrels and started a fire. As a professional wedding photographer I see many celebrations and events at a few things surprisingly anymore. However, when I saw the flames, I thought something went wrong. I kept photographing and the couple started dancing and beating the drums that were lit on fire. Around them the guests were dancing in the atmosphere was out of this world. 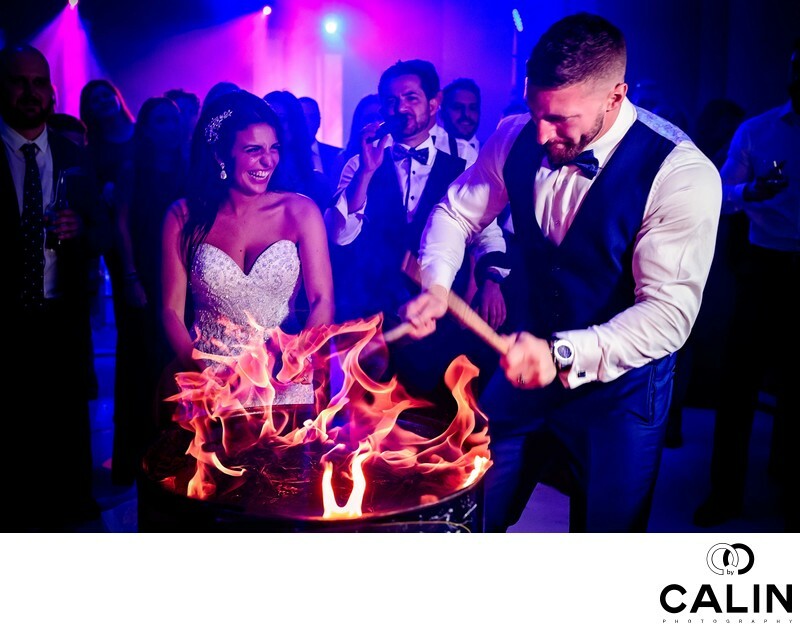 In this beautiful image, we see the bride and groom looking at each other, laughing and beating the drums. It might sound cliché but I can feel the love in the air and the flames are nice touch alluding to this this metaphor.